Art therapy what is that? How can that help me? How does it help anxiety and stress? 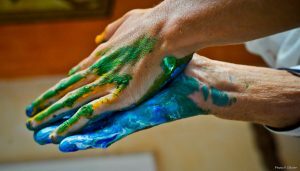 Art Therapy is a way of combining talk therapy with the creation of art making. Did you know that when we just talk about anxiety and stress, can lead to your body re-experiencing the situation? When you create art it uses a different part of your brain, the right hemisphere so a person can be more expressive, intuitive and emotional. It helps many different populations and is very effective for managing anxiety. Art therapy is it is about the process not the product. Having a new experience is the most important thing and finding alternative solutions not what the artwork looks like. As a society we believe that being able to express ourselves verbally is the most important thing. However in the language of emotions it can be very difficult to express verbally. This is where art can be a a tool of exploration, expression and experimentation. Art that is the most helpful for people who have anxiety is art task that make person feel contained and safe. This some of the tasks includes: using mandalas to color, since they are being contained by the lines. Clay is also helpful to have people have a tactile experience to calm the nervous system and release some of their tension and stress. Creating glitter jar is relaxing and helps a client to see how something can be stirred up and then it calms down. Talking about the anxiety without externalizing it can be activating for the person and can make their symptoms worse instead of helping them to channel them in another way. Art allows people to externalize their problems and experience them in a new way. When one externalizes anxiety and stress they gain the opportunity to see that it is no longer just a part of them. When something is separated from a person it becomes possible to look at the anxiety objectively. Sometime we have to change the way that we look at things in order to change them. If you are physically viewing a problem like anxiety when you put it on a piece of paper you can turn it upside down you can alter the picture to help you to viscerally have a new experience. This experience with the therapist can help the person to have an in vivo experience in life. By creating art work about a problem that a person is experiencing, the creator gains more self awareness about their cognitive thoughts, emotions and ways of experiencing their life. By externalizing a person’s anxiety gives a person new perspective and understanding about ones self. I have had clients when they make a piece of art it helps them to realize that their anxiety was linked to feeling of being sad or angry. It was not until they saw it on paper that they made the connection. Art therapy can give you a road map to your soul if you are willing to see what is there. It can improve your emotional intelligence and allow you to see how you react to the challenges in your life. When you use art supplies and you are in the moment of creation, you are breathing deeper and focused on the present moment. Part of the issue with anxiety is that people are worried about a future event or something that could happen. When you are making art you are just concentrating on what is in front of you. Many of my clients that have come to see me report that they feel less anxious, can sleep better and feel less stressed as a result of doing art therapy with me. Whenever we are capable of living in the present moment breathing and creating the more we can live our lives more fully. Art therapy gives you opportunities to use different parts of your brain to create new solutions which talking does not allow you to do. Since art therapy is an experiential therapy it uses all of your senses. Since you are having a completely new experience this helps to create new neurological pathways. The brain likes new experiences, this elicits curiosity which allows for change to happen. The brain can be transformed by having novel experiences. When you have a positive experience processing something difficult you are more likely to want to continue working on it. Art is a containing, pleasant and positive way to work on anxiety. I hope that this post has helped you to understand the benefits and power of art therapy. What is your favorite kind of art to do help you to relax? Coloring counts!! Leave your comments below. Please feel free to contact me to schedule your free 15 minute phone consultation at celine@innergrowththerapy.com or 323.515.2278. Have a blessed week!